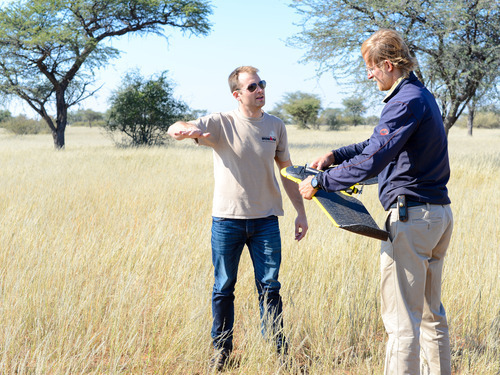 There is much talk on how to use drone mapping technology for nature conservation. However, projects with results that are applicable for both conservation land use management and wildlife conservation (such as animal counts) are few and far between. 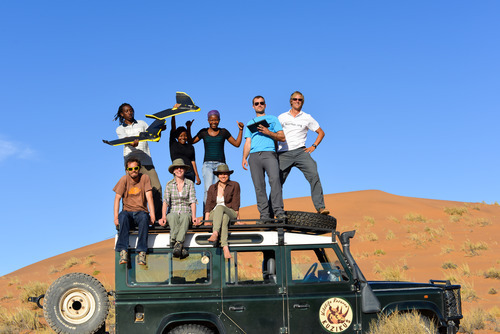 This past May, Drone Adventures teamed up with Kuzikus Wildlife Reserve and the Polytechnic of Namibia to carry out a two-week mapping mission to explore the variety of uses that drone mapping can offer nature conservation. Researchers, local communities, governments and hundreds of NGO’s have been using new technologies to help them conserve the many natural wonders and animal species that must co-habit with the ever growing human population. Namibia is on the forefront of nature conservation its government – as well as a large number of private landowners, local communities and tourism companies – dedicate vast efforts to conserve the semi-arid savannahs and desert environments that make up 90% of the country’s surface. Namibia’s universities, such as the Polytechnic School of Namibia or UNAM (University of Namibia) prepare the engineers, researchers and tourism professionals of tomorrow to address the many challenges of nature conservation to preserve the country’s unique landscapes and wildlife, all the while using these resources to support the local economy through responsible tourism and farming. At their request, after hearing about the initiative led on Kuzikus, we led a half-day workshop bringing together engineers, professors, students, researchers and government specialists. 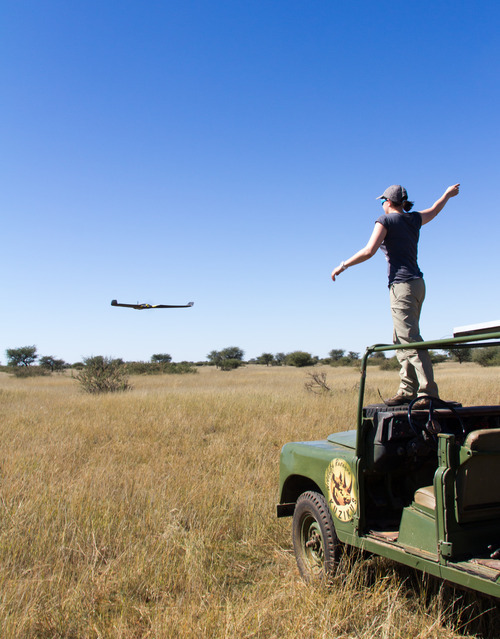 The goal of this workshop was to introduce the basics of drone mapping technology and our first experiences made on Kuzikus Wildlife Reserve in the days before hand. We shared our knowledge on hard- and software, and our various mapping experiences, but the excitement and interest of the workshop reached its peak during the flight demonstration that proved how easy and accessible drone mapping technology has become. 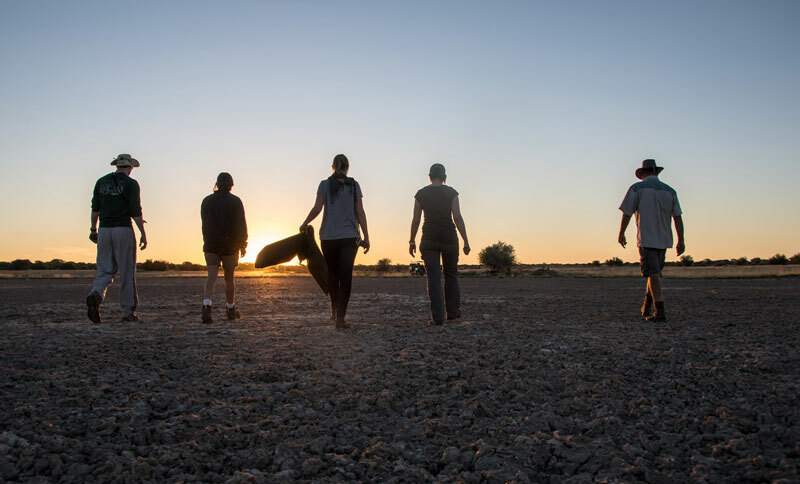 The Gobabeb Research and Training Centre is an internationally recognized center for dry land training and research, located in the Namib Desert. Gobabeb’s mission is to be a catalyst for gathering, disseminating and implementing understanding of arid environments. 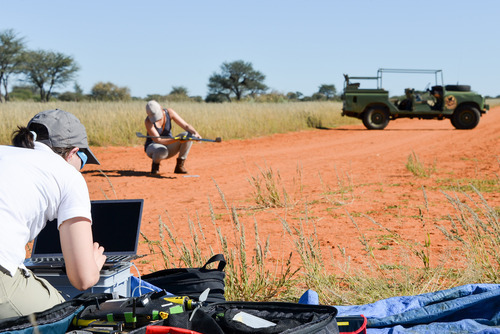 With many specialized research projects, Gobabeb was the perfect place to add another dimension to our Namibian mission: testing how drones and photogrammetry software can handle the difficult environment of one of the driest deserts on earth all the while producing meaningful results. We spent 2 days at Gobabeb. The first day was used for providing geo-referenced orthomosaics and 3D models for an ongoing research project on the endemic !Nara plant, distributed over long corridors in the dune valleys. A total of 3 flights over the valley, with both RGB and RE (Red Edge) cameras provided a 5km long, 500 meter wide corridor map with enough detail to easily geo-locate and assess the !Nara plants. 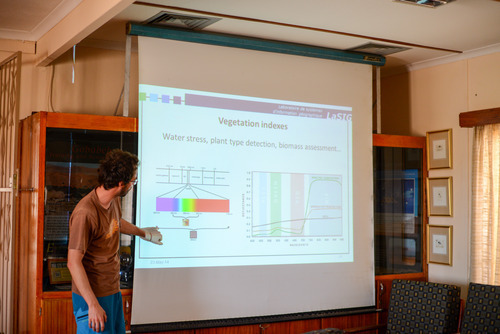 Very much like our days in Windhoek, the second day was used to host a workshop for the researchers of Gobabeb, introducing the elements of drone mapping to them and sharing discussions on how this technology can help their research projects. 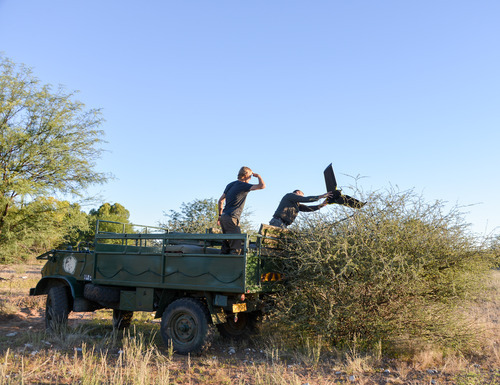 While this first nature conservation mission was able to test the use of drones for nature conservation purposes, the initial results lead to many more questions. 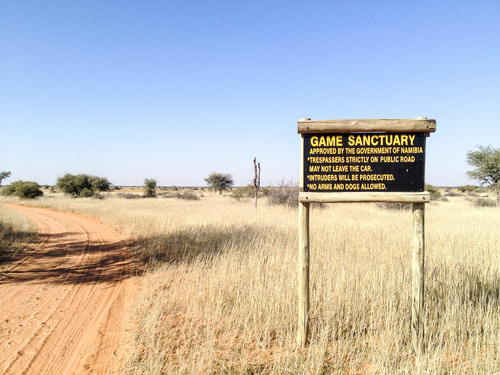 During this mission, many additional possibilities of use have been determined, not only on Kuzikus Wildlife Reserve but also at the Gobabeb Research & Training Center. 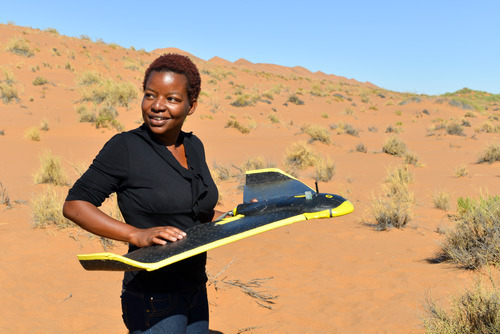 The possibility of using NIR and multi-spectral sensors to compliment terrestrial research for rare plant species (such as the Welwitschia or !Nara plants endemic to the Namib desert) offers not only additional research possibilities but also more efficient surveying of larger areas that are difficult to access on foot or car. Our goal is to find additional funding to return to Namibia in the spring of 2015. A second mission to the same areas would enable follow-up on research and provide updated maps of areas already surveyed during this first mission as well as map new areas in the Namib desert to produce high-resolution maps and indices for the Gobabeb researchers. In the meantime, researchers at Kuzikus Wildlife Reserve, EPFL and UNAM are hard at work analyzing the 350Gb of data that we collected during our short stay. As we gather more concrete results in animal counting and identification, plant health analysis and land management we’ll be posting follow-up stories, hopefully inspiring further research and bringing drone-mapping technology into the hands of conservation leaders. We call this dataset “The three deserts”; the dry Kuiseb riverbed has enough water during the year to support lush green trees on its dry shores, and creates a natural border between the red sand dunes of the Namib desert to the south-west and the rocky yellow expanse of the to the north-east. As an added bonus, have a look at this video fly-through of the dataset!